Put all the ingredients except for the milk in the processor and then blitz till smooth. Pulse while adding milk, to make for a soft, dropping consistency, down the funnel. Alternatively put all ingredients into a large mixing bowl and use an electric hand mixer. ​Spoon into the cases equally. Put in the oven and bake for 15-20 minutes until the cupcakes are cooked and golden on top. As soon as possible, take the cupcakes in their cases out of the tin and let cool, on a wire rack. When the cakes are completely cool, prepare the icing. Mix the sieved icing sugar with the water in a bowl, beat until smooth. Add vanilla or rosewater essence and a drop of pink food colouring. The icing consistency needs to be thick enough to coat the back of the spoon. If it's too thin add a little more sieved icing sugar, if it's too thick add a few more drops of water. Remember to do it little by little. 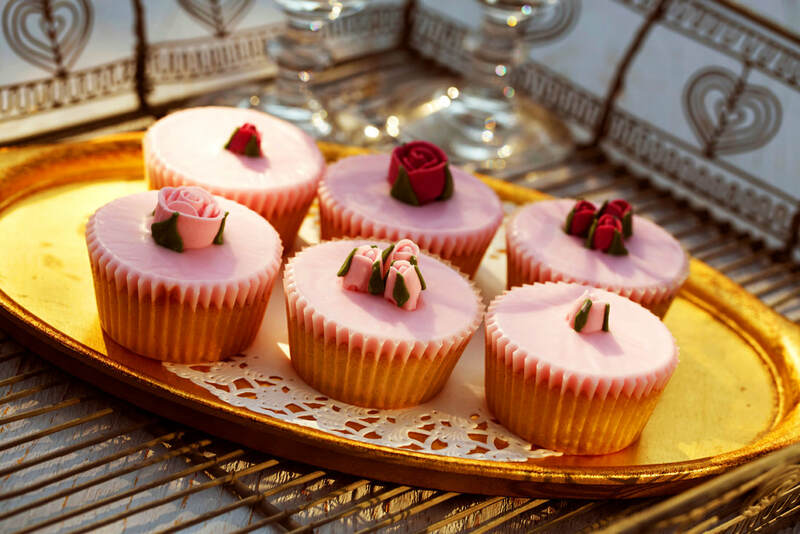 Spoon icing onto one cupcake at a time, place a Cake Angels sugar rose in the centre of each cupcake.